After what felt like the longest winter in history (even to grown-ups) Easter is the time to finally get out of the house, stretch your legs and feel a fresh spring breeze in your hair. 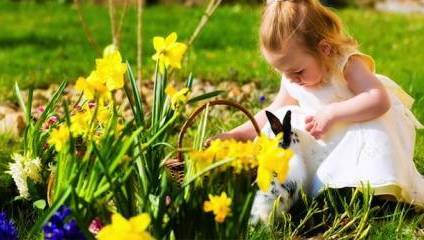 There are plenty of London parks and gardens with special family events to celebrate Easter in style. Kew Gardens invites children and parents for A Big Day Out With Peter Rabbit™, the first ever Peter Rabbit themed Easter festival at Kew Gardens. Visitors can expect an activity-packed day out with games, crafts and storytelling inspired by Beatrix Potter’s iconic tales, with the gardens filled with blooming crocuses, daffodils and magnolias. At the gates, visitors will be presented with their very own copy of Mr McGregor’s garden notebook so they can follow a Peter Rabbit trail to the festival hub in Kew’s beautiful Secluded Garden, find out what Peter and his friends can eat and how fruits and vegetables grow. In the festival hub, children can try building a warren to make a home fit for Peter and his family. At Mr McGregor’s potting shed, visitors will get the chance to create incredible monster vegetable prints to take home. Kids will also be able to plant their very own seeds pots to take home and nurture. Activities will run from 10.30am – 3.30pm on Friday 30 March – Sunday 15 April. For little animal lovers, the annual Easter Baby Boom at Lee Valley Park Farms will be in full swing. From 30 March - 15 April, children will be able to hand feed bottled milk to the new baby animals and get up close to many of the smaller inhabitants of the farm. Afterwards, there is the chance to take a ride on Tex the Tractor to a working dairy farm. Tickets are £10 and visitors can round off the day with delicious homemade cakes and freshly prepared food in The Bumblebee Café. From 30 March - 2 April guests can enjoy a fun-filled day of Easter activities at LEGOLAND Windsor Resort. Little ones can transform into Easter bunnies with their own free LEGOLAND Easter bunny ears on arrival, before venturing into Miniland for the egg hunt, searching high and low for LEGO Easter eggs hidden among models of iconic world famous landmarks, made entirely of LEGO bricks. Junior builders can show off their building skills and construct their very own LEGO Easter themed mosaic to put on display for all to see, or get creative with Ollie’s Easter colouring, before heading out into the resort to take part in a Scavenger Hunt. New for 2018 is the LEGO Reef, a digital LEGO aquarium where little divers can let their imaginations take over. Using touchscreen technology, guests can create their very own virtual LEGO fish before casting it off into the ocean and watching it swim through the interactive floor-to-ceiling coral reef. At the Natural History Museum, spring comes in the shape of hundreds of live butterflies on show up-close in the tropical butterfly house. This technicolour exhibition features a huge variety of beautiful butterflies, ethically sourced from Africa, Asia and the Americas. You can follow the trail through a jungle habitat in the heart of London as butterflies fly around you, passing hungry caterpillars, insects emerging from their chrysalises and busy feeding stations. Kids and families can find out fascinating butterfly facts and learn more about the behaviour and diversity of these much-loved creatures. Sensational Butterflies opens on 29 March and family tickets are available. Easter is also a wonderful time to visit WWT London Wetland Centre as new life bursts out all around with babies, bugs and buds in abundance. For just £1 per trail, 30 March –15 April, you can join the Easter GIANT duck hunt around the nature reserve to discover where they are hiding. Look up as well as down, as ducks like to perch above you sometimes. They also love splashing around, so they won’t be far from the water. If you find them all you’ll win a prize! You can find out how to build a nest during one of the Wild Play sessions or opt for a spot of Pond Dipping. If your children are early birds, you can come at 8.30 while most Londoners are still tucked up under their duvets and enjoy some peaceful bird watching or a walk among beautiful scenery to start your weekend. If you are hosting Easter celebrations at home and need some inspiration, Petersham Nurseries Shop in Richmond and Covent Garden offers tablescape ideas, exquisite linens, fine porcelain ceramics and engraved glassware accentuated by joyful floral displays and potted seasonal plants. The Delicatessen at Petersham Nurseries in Covent Garden, will stock a selection of traditional sweet and savoury treats, where for the first time, homemade chocolate Easter eggs will fill the shelves. For one lucky customer, one of the 200 Easter eggs will contain a ‘golden ticket’, which will be a prize of afternoon tea for two at The Petersham when it launches this summer. Indulge in some rich fruit cake iced with eleven balls of marzipan or enjoy a slice of ‘Colomba di Pasqua’, a dove shaped cake topped with sugar and almonds. If your children are crazy about the Sylvanian Families toys, take them to Hamley’s toy shop on 22 March - 25 March for a special event: a new addition to the Sylvanian Families characters, fashion designer Stella Chocolate is showcasing her debut Spring Summer collection on the world’s smallest catwalk. On display on the 2nd floor, there will be 40 exquisite, handmade little outfits modelled by your favourite Sylvanian characters on a tiny automated catwalk. The Mall Wood Green will be hosting an egg-cellent, Alice in Wonderland themed Easter event on 7 April. Visitors will be given the opportunity to fall through the rabbit hole and join Alice and her friends, including the Mad Hatter and the Queen of Hearts, in their fantasy world of Wonderland from 12pm until 5pm.Youngsters can take on the Mall Wood Green’s croquet challenge in return for a chocolate treat or take advantage of The Mall’s face painter who will be transforming children into their favourite characters free of charge. Stilt walkers and jugglers will also be on hand throughout the day entertaining crowds. On Monday 2 and Tuesday 3 April, discover the Narnia stories at Westminster Abbey, where author CS Lewis is remembered. Children can learn about the mythical creatures that exist both in Narnia and the Abbey, and count how many Aslans they can spot. Aslan at the Abbey is free but you need to book in advance. If for your family, Easter is mostly about chocolate then the Chocolate Museum in Brixton is offering Family Easter Egg Making Workshops, where little ones can really dig their hands into the good stuff and create Easter chocolates using egg, animal or lollipop moulds. You can choose your favourite chocolate and learn how to temper it as well as painting and decorating your creations. At the end of the workshop, each participant will have delicious and handmade Easter creation to take home! Workshops are at 11 am on 5 & 6 April and are £12.